With the re-launch of DavidBach.com, I wanted to have my first post for you be one of life-changing value. Not since my appearances with Oprah on The Oprah Winfrey Show have I had an interview that I feel is this valuable to share. 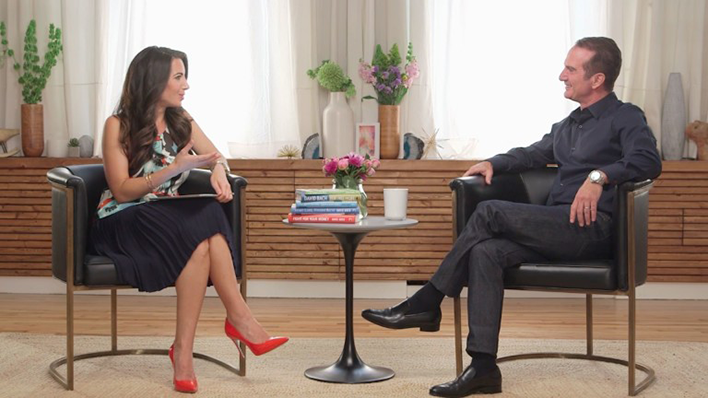 In this conversation with Marie Forleo, I reveal how to truly live your richest life, a practice based on my philosophy around “when your values are clear your financial decisions become easy”. I’m so excited that you restarted your blog. I read Automatic Millionaire in my early 20s and it really had an impact on my life. Unfortunately when I went in to business for myself I started to backslide. I only recently picked up your book again to get myself back on track. I’m really excited to hear about the newest edition, the timing couldn’t be any better. Funny enough I’ve heard Marie mention your name in past videos as I nod in agreement with her testimony each time! Thanks again David for sharing your knowledge. Robert, that’s awesome that you’re back on track, so glad you’re here with us! Get your FREE, expanded and updated copy of The Automatic Millionaire HERE! Read all his books and think he is wonderful with alot of great information!!! Thanks Wayne, glad you’re here! Don’t forget to get David’s FREE copy of his updated and expanded book, The Automatic Millionaire! It’s free, plus shipping and handling. Click here! Wonderful advice that we all should take! Read Automatic Millionaire when it came out and can’t wait to read the new one due out this year! Thanks, David, for caring! Thanks Joanie! We’re so excited to hear from you and really appreciate your comments. Here’s the link early to the get a copy of David’s completely updated and expanded edition of The Automatic Millionaire. Great interview! This video just confirmed what I have learned through the years of reading David’s books and attending his seminars. Thanks to David I have saved tons of money, I review it all once a year and make adjustments, almost always increasing the savings. I am now 65 and have no plans of retiring for 10 years – maybe a good thing maybe not – I want to continue on the path that David helped me start. Can’t wait to read the new book! Thanks Linda! This is actually “David Bach” reading our first posts and so excited to hear you enjoyed the video. You are literally my first reply on our new blog! Great to hear from you! WOW! Nothing makes us happier than to hear how well you’re implementing our tools, congratulations! Don’t forget, to get a free copy of David’s completely updated and expanded edition of The Automatic Millionaire, click this link! It’s FREE, plus shipping and handling. Enjoy and thanks! Really great video and advice from David as always, can’t wait for the updated/revised edition of The Automatic Millionaire! Thanks Arthur! So glad you’re excited about the book and are enjoying David’s advice! You can click here for info on his updated book! I am a huge fan of David’s books. I was so inspired I began to teach others the stuff I learnt. When I first read the book I had no IRA, no 401 K and even though I was paying myself first and giving to charity I did not have automated savings. I cut out my latte factor and have automated savings and now have an IRA. I feel that David gave me new insight on personal finances. Today watching the video I am motivated to take a long break to get back my energy and drive as I feel exactly how David felt when he said he wanted to take a year off and do nothing. May God bless you and all that you are doing to help others. Jaseth, thank you so much for sharing! That’s awesome about your automated savings and your motivation to take a sabbatical! Would love to hear more about your plans, feel free to share! Values first! What a life-changing perspective. It explains so much conflict and stress. This really is the “one thing to do”. Can’t wait for the book. Thanks Donna! Values really do seem to change everything, such a great place to start. Regarding the book, just click this link for more info! I have read all your books and have been saving automatically for years now. My net worth is almost a million dollars and I am 41. What I loved most about the video is how you talked about values and how you are living within your own values. I have learned that life is short and that even with all this money it doesn’t mean anything unless you do live focusing on what matters most to you. Thanks for everything David! Rachel you are so welcome. And congratulations! Would love interview later and learn more about how you accomplished what you’ve done. And “yes” its all about values, which I simply love to teach and rarely have the right amount of time on television to do it. It was so nice to do an extended interview and go to the “heart of it”. Thank you for saying hi and posting! My Big Take Away: “What is your reason for getting rich?” I know I have what I want to do with the money, but other than that not a reason. Also, “Get a will.” I think about it from time to time, but haven’t done that yet. Nichelle thank you! Now go get that Will and swing back to me so I can say “well done”. Cheers! Adeline! Thank you the post. I’m really glad you watched the video. Marie is fantastic. I adore her. And you won’t have to wait long, we hoped to launch the new book to our community first early in June. Stay tuned. And you stay blessed! Melissa, you are so right! Now if we can just teach ten more million people this simple powerful, timeless trick. Thanks for saying hi! How can I get a copy of the updated book? Hi Melissa! You can click this link which will take you to where you can get David’s updated book (shipping and handling not included). Hope this helps and so glad you’re here! Many thanks for such an inspiring discussions on life styles and values with goals. I enjoyed it all.God Bless You! Having bought, read and-still do read David Bach’s Books – It was great to get David’s mail and come to know about Marie. Salim! So glad you enjoyed the video. It’s really nice to hear from you and I am super grateful for your post. Hi David, I thought the video makes a lot of sense. Thank you. I have also read several of your books, and have even given Smart Couples Finish Rich as part of wedding presents for the ‘younger generation’ on several occasions. However, I have just followed your link to get an early copy of your book, but haven’t completed it because I am based in the UK so not sure how much of your new Investment ideas are applicable here? Any views? Hey Trish. Always fun to hear from my UK friends. If you have not yet read The Automatic Millionaire I would read it. The investments are going to be US based, but 95% of what is taught is worldwide timeless advice that you should be able to apply in the UK (you will need however to find the right investments and retirement accounts for the UK). We ultimately could use to do a UK translation if we can get a publisher to do it! Hi, it was the automatic millionaire that started me following David, many years ago. Also sent it to my two adult sons. The younger one has followed the principles and doing very well. Older one now starting to realise it makes sense! The passing on to the next generation of the ‘Smart Couples Finish Rich’, was driven because I perceived they were less switched onto ‘our money’, but rather than ‘yours’ and ‘my’ money. A simple differentiation but very important…. So excited, I received automatic millionaire from my father, and passed the page worn book to my daughter. Was tough to see it go as I referenced it often. Look so forward to the updated version and working it with my new spouse! So nice to hear TAM is being passed along through your family and generations. That was my dream. Keeping paying it forward. Enjoyed the video very much and excited for the new book. I read “Automatic Millionaire” right out of college but didn’t fully implement the principles. I recently re-read the book almost after a decade and I am following the guidelines more closely now. Thank you very much for this unique much needed financial education. It’s been interesting Vynod, to know you’re not along in re-reading The Automatic Millionaire. When you’re in a different phase of life, sometimes certain lessons resonate more. Glad you’re back with those guidelines and glad you’re back with us! Debbie, so glad to hear you’ve started, congratulations! Thank you for your great conversation with David Bach and Maria Forleo. I read your book “Start Late Finish Rich”, which is very fascinating. I have started saving a small amount of money every day, which saved me money, which I could use for dental work. I would have loved to have used that money for something nice, but this was absolutely necessary and I feel very good that I could use it for it. I still dream of having enough money when I am old. Deepa, congratulations on saving a little every day, that’s terrific! And while your recent savings went to necessary dental work, keep your dream alive. With good planning, it can still happen! I’ve always wanted to be able to control my financial life and be able to be off work when I want; and to this day I have not been able to do that. Listening to this video just made me realize that a sabbatical leave is another form of having this freedom I’ve been craving for and I totally embrace this idea of having 6 weeks sabbatical leave. Thank you David, you always bring out great ideas of living a prosperous life. I loved the automatic millionaire when it came out and I automated my financial life, retirement, dream account and pay myself first account (other forms of investment such as small business) and my stock investing account, and all that with a very limited salary under 50K. Welcome back and I can’t wait to hear or read your updates. It’s so wonderful that David’s sabbatical inspires you to take a leave of 6 weeks! So glad to have you back with us, would love to hear what you do on your own sabbatical! David and Marie are so inspiring. I love the idea of living rich. Thanks Daniel, we love Marie too! Such great content. Here’s to you living rich! Very inspiring!!! I have read all of David’s books and this made me rethink some of my choices. I loved your emphasis on being present! Great interview!!! Thanks Connie, we loved that interview with Marie too! Loved the video. I have read a few of David’s books and shared with my friends. I love the latte concept it’s a simple way to start thinking about where you can find money to save and create financial stability. I talk about this with friends all the time regarding the money they spend on coffee daily. I say “make it at home”!. I am doing well for myself and feel financially secure at age 47. I also give quite a bit to charity I slhave 9 nieces and nephews and i decided for Christmas 2 yes ago that i would take the money I would spend on gifts and send to their charity of choice. They loved the idea and I hope it will get them thinking about how they can help others at an early age. Thanks for putting all the fiancial jargon in words that are easy to understand. I’m a firm believer knowledge is power and your books make it easy to get started and get educated on how to be successful with getting rich and or becoming financially stable. Michele, that is awesome about giving to the charity of choice, regarding your nieces and nephews! What a great example to show them. And, so glad you’ve found David’s books useful and that they’ve given you a sense of financial power. So glad you’re here! Keep up the great work! Just when I start thinking “I’m in trouble but I don’t know what to do” your email hits my inbox. Your interview was greatly informative and made a lot of sense. There are some suggestions here that I will have to start implementing. Recently I have just received a few of your books from a friend but haven’t had a chance to read them in depth. This is just the incentive that I need. Will look forward to reading your next book once available. Pauline, so great to hear the timing of David’s email an updated book is just right for you. And glad you enjoyed the interview as well. We love Marie, and we’d love to get updates on your progress. Thanks for being here! I received your Canadian Edition of the Automatic Millionaire as a gift when it came out, and found it as an extremely helpful and simple common sense guide. I was wondering if this new release or free copy will be available in Canadian edition as there are some fundamental differences in financial options available in the US vs Canada. Also, why not release it in a electronic format so that we don’t need to pay S&H? As of now we unfortunately don’t have an update planned with Canada. Hopefully change once they see this update! We love you guys and really appreciate the fan base we have there. As for why we can’t giveaway the update on ebook its complicated. We’re having to buy the book the from the publisher then send it to storage, then pack it and ship it. The publisher isn’t giving the book away for free. Thanks for saying hi! Good to hear from you. I am glad your back David ! I will be tracking my money to see where I am spending money foolishly ! Thanks for the advise about the money date ! Thanks Kimberly! It’s great to be back, and we hope to hear more about your progress! Thanks Daria! And sorry it got erased I hate technology glitches too but you just made my day saying hi and thank you! It’s always helpful to read content from other writers and practice something from other sites. Thanks Elinore, we’re always happy to hear that readers are finding the web content helpful! I loved the Latte factor. I have been preaching it to my kids for years. Same about the expense tracking. Some do it and some do’nt. What do I do with them? I cannot love their life. Maybe if they hear it from you they will do it. Thank you so much! For any inquiries related to joint ventures or content options, please use the contact form on the site so the team can best serve you. Thank you again! Excellent post. I found myself checking constantly this blog and I’m inspired! Thanks Erica! It’s wonderful hear from people like you and that you are inspired. Keep up the great work! Thanks Dirk we appreciate you saying hi and I’m happy it’s been helpful. Good luck! Nice to know you found it helpful, thanks! Hi! This is certainly my first holiday to your blog! I’ve learn several excellent stuff here. Definitely worth bookmarking for revisiting. I wonder how a lot effort you put to create this kind of magnificent informative web site. Thanks for all of the work on this site. Kim delights in working on investigations and it’s really simple to grasp why. Most people hear all about the compelling means you produce worthwhile guidance via the website and inspire response from visitors on this topic then our favorite simple princess is truly discovering so much. Take pleasure in the remaining portion of the new year. You have been conducting a really great job. Wow, incredible weblog layout! How lengthy have you ever been blogging for? you made blogging look easy. The overall look of your site is great, let alone the content! That’s great news! What was most helpful to you? I am glad to be a visitor of this staring blog! , thanks for this rare info ! . It’s in reality a nice and useful piece of information. I’m satisfied that you simply shared this helpful info along with us. Pretty nice post. I simply stumbled upon your blog and wished to mention that I’ve truly loved browsing your blog posts. After all I will be subscribing for your feed and I hope you write again very soon! So glad to hear you’re enjoying the site and the blog posts. Would love to know what you’re take-aways are! with David Bach – Official Site of David Bach. 9X New York Times Bestselling Author <Loved it! So glad you found it useful, hope your roommate does too! How can I get interactive dolp? Thanks for asking about the DOLP. We’re working on an updated version. Stay tuned, when it’s complete, we’ll have it on the site. Thanks! Greetings! We have not heard of anyone else having issues. Have you tried loading the site in Chrome? Sometimes that can help. Great post, I conceive people should acquire a lot from this weblog its rattling user genial. Thanks!We’d love to hear about your progress, keep us posted! It?¦s actually a great and helpful piece of info. I am happy that you simply shared this useful info with us. Please stay us informed like this. Thank you for sharing. this weblog is in reality remarkable. am just satisfied that you just shared this helpful information along with us. Please keep us current this way. Thank you for sharing. but after evaluating a few of the posts I realized it’s new to me. Glad to hear you’ll be book-marking the site! Tell us what you’ve learned, we’re always looking for ways to give best tips! I just want to tell you that I’m very new to blogging and definitely loved this web blog. Probably I’m going to bookmark your blog post . You really have excellent posts. With thanks for sharing your web-site. Great, glad you’re liking the blog! Keep coming back and tell us what you’ve learned. Also, there’s a free newsletter on the site should you want to get some more tips. Thanks for the feedback! Thanks for your short article. I would also like to say that a health insurance dealer also utilizes the benefit of the coordinators of the group insurance coverage. The health insurance professional is given an index of benefits searched for by a person or a group coordinator. What any broker does is try to find individuals or maybe coordinators which in turn best match up those requirements. Then he shows his tips and if all sides agree, this broker formulates a legal contract between the 2 parties. Health insurance is certainly tough to muddle through- thanks for your tip! Wow, this piece of writing is good, mysister is analyzing these things, so I am going to letknow her. So glad you’re sister (and you!) are finding the site useful. Be sure to take advantage of our free newsletter and sign up! So glad you’re here, thanks! I have taken note that of all sorts of insurance, medical health insurance is the most dubious because of the turmoil between the insurance cover company’s necessity to remain adrift and the consumer’s need to have insurance coverage. Insurance companies’ revenue on wellness plans have become low, therefore some firms struggle to earn profits. Thanks for the concepts you reveal through this site. Thank you so much for doing what you guys do. Just wanted to share my story. I’ve followed David at the beginning of this year because I wanted to be financially educated. Since then I’ve become a 101 financial student and NOW an instructor. I’ve been able to get rid of my credit card debt, the entire last year of my car loan, and 8 months worth of rent in 4 months. Listening to David has made me proactive about my finances. I’ve started my retirement fund, soon to be a TV cable cutter, switching up phone plans, etc. The double latte factor is truly and eye opener for me and really trying to stick it out taking from what David has taught and what 101 financial has taught me. I think that the one thing that I got out of the books “Automatic Millionaire” and “Start late, finish rich” is that your income has no impact on you becoming rich. It’s your spending. That has shaped the way how I look at things. Will there be an updated Automatic Millionaire? Or another book out, I’ve noticed that the information is before the stock market crash, etc. Thank you for your time and keep it up! Thank you SO MUCH for letting us know your incredible story. Honored to be part of your financial journey. We are actually releasing a brand new updated version of the Automatic Millionaire which will release on pre sale via Amazon SOON! Sign up for your free “Finish Rich Quickstart” on the blog and you’ll get the notification when it releases. Thank you again! hi, I came to hear about you through John Assaraf’s program. Love that you took a sabbatical! I quit my job in May and I’m taking a sabbatical: “living rich now” how you put it! Enjoying to be a stay at home mom for my 7 and 10 yr old sons, enjoying living slow, enjoying some programs about personal growth. I think a book on the topic would be much needed! That’s great regarding your sabbatical! So glad you found us through John Assaraf’s program. Keep us posted of how your sabbatical changed your life! I am a person who rarely comments or chimes in but I feel a sense to do so. I originally was given a copy of the Automatic Millionaire when I was 29 years old. I was still somewhat naïve and immature back then. What caught my interest was a chart within that book that showed how simple automatic investing over a long period could really build wealth. No gimmicks, no games…just steady no nonsense monetary contributions. Fast forward 10 years and I can’t thank David enough for changing my life and ultimately changing the lives around me. There is nothing like seeing someone, especially a young person who does not make much of an income have an ah hah moment that they can really control money. People look for authenticity in ones message and David Bach message really does change peoples lives. It changed mine. Thank you! Thank you so much for taking a moment to let us know about your success. Incredible work, well done! I took a 3 month sabbatical over the summer 1.5 years ago. The ability to just relax and spend the summer home with my kids was amazing. Afterwards, I was so much better rested and happy. In fact, I felt so much better, I quit my job after being back for 3 months. I did go back to another, more relaxed position at another company (probably too soon). I would love to do another sabbatical! My sabbatical and quitting my job was made possible because I have followed your principles for most of my adult life. I am now doing the latte factor for my household. I am also applying the concept to the food that I eat (so I can see where I am wasting calories).